Berkeley's luxury takeout hall, Epicurious Garden, claims its first casualty after eight months of operation. 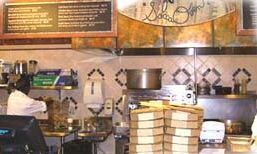 Socca Oven closed Oct. 30, reports the Express' John Birdsall, he of the emdash obsession. Socca is backed by the Frenchman behind Gregoire in Berkeley and on Piedmont Ave in Oakland. A Socca is sort of a French country pizza, with a pancake cooked in a very hot oven until its crispy like a flatbread, then topped with vegetable, seafood or meat. The owner says business was great, he just had some "differences" with his partner. Probably over, you know, exactly how "great" business was.